Dragon Quest XI: Echoes of an Elusive Age has just launched in Japan and has sold like hot cakes. The game features hours of JRPG goodness that will no doubt keep players busy for some time, but even when the quest is over, the entertainment value doesn't end there. It has been revealed that upon completing Dragon Quest XI, players are issued with a special code which can then be entered in the game's password menu. The code unlocks the original Famicom / NES version of Dragon Quest (known as Dragon Warrior in the west). It has already been confirmed that Dragon Quest XI is headed to the west; hopefully it will make it over with this neat little bonus intact. That's really cool! Not many companies want to do stuff like this anymore, which really is a shame. Also the 3DS game's completion awards you with the code for DQ1? That's pretty cool. Meanwhile Nintendo is hiding higher difficulty levels behind amiibo paywalls now. @NewAdvent I think it's because they also plan on selling it separately. I read from another site, the unlock calls it "Dragon Quest free version". Eluding to a paid version. Known as Dragon Warrior in NA. And no need for any Amiibo.....take note Nintendo! @jbopatrick That would be really cool. Dragon Quest should have been on the VC back in the Wii days. That's nice of them and all but until this gets a Western release on Switch it the game may as well not exist to me. As a Nintendo console owner living in Europe I haven't been able to play any DQ game. DQX on Wii and Wii U? Never came West. 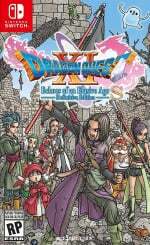 DQH 1&2 on Switch? Almost certainly won't get a translation. DQXI? Still haven't seen the Japanese version on Switch, nevermind it getting a release here. It's supposed to come West but is that just for the 3DS? Similar to MHXX on 3DS. I've never heard Nintendo give any explanation or talk about why we don't get them. @PlayedNSlayed Nintendo will "take note" when people stop buying the Amiibo. interestingly this is not just a VC release. it actually uses the bottom screen as a map. For those of you who have never played the NES version: It is super difficult to get into and the control interface is beyond archaic. Nice of them to offer, but unless you grew up with this game, it's a chore to play unlike say Super Mario. @Einherjar I'm assuming it's not even the NES version, but the Famicom version, which is much more primitive. The player can't even face different directions, so much like the early Ultimas, if you want to talk to an NPC, you have to select a direction as well. @SLIGEACH_EIRE It can be argued that the series is primarily a handheld series, with IV-IX all releasing on DS/3DS in the West. The above comments have put me off even wanting to play the original but I do want XI! I can still hear the originals battle music in my head as I read this! @Expa0 What are you referring to? @SLIGEACH_EIRE Nintendo just has this really odd relationship with Europe for some reason. I hope so as we never really got DQ1 (or Dragon Warrior) in the UK. @SLIGEACH_EIRE I own DQ 1 through to 9 all on GB, GBC, DS, and 3DS. Its primarily a handheld game outside of japan. @SLIGEACH_EIRE "DQX on Wii and Wii U? Never came West." Dragon Quest 10 is an MMORPG. Of course it never came West, because people in the West don't even buy the regular games. They sure as hell wouldn't buy a game with a monthly fee. "DQH 1&2 on Switch? Almost certainly won't get a translation." There is no reason to believe it won't be released here, especially since there already are translations. "DQXI? Still haven't seen the Japanese version on Switch, nevermind it getting a release here. It's supposed to come West but is that just for the 3DS?" Of course they didn't show of the Switch version yet. Nobody in Japan would have bought the PS4 version if they did. They want people to double dip. And the only version of Dragon Quest XI that MIGHT not make it to the West is the 3DS version and not the Switch version, lol. "Similar to MHXX on 3DS. I've never heard Nintendo give any explanation or talk about why we don't get them." We don't know if we will get it, but even if we won't- why would you expect an explanation from Nintendo? This is a third party franchise. Nintendo published the 3DS games in Europe, because at the time it was a Nintendo exclusive franchise. With the announcement of Monster Hunter World that isn't the case anymore. @scamander Not sure if I'm following you. That's a really nice unlockable, wish more remakes would do this. @scamander "Of course they didn't show of the Switch version yet. Nobody in Japan would have bought the PS4 version if they did." This might be one of the most absurd statements I've ever read on here. Do you know how popular the PS4 is in Japan? Awesome!! Hopefully we get same treatment. That is very cool! I already have all of the early Dragon Quest games on my iPhone from the App Store, but this is a great way to get younger people to enjoy the original. I was just a kid when I got Dragon Warrior as part of the Nintendo Power promotion. This is the kind of thing I wish happened more. I don't care about getting new skins, I don't care about trophies. Getting a game is a incentive to finish a game. And this builds a sense of loyalty among the fans. I really hope this comes to the Switch. As an aside, I hope the RPGs start to take off, that's the genre perfect for the Switch. I care a lot more about making the Switch my go to RpG console than about whatever ports Capcom wants to cash in on. @SLIGEACH_EIRE Unless they optimize the game properly, I don't want DQ Heroes 1 & 2. Slowing down during battle is unacceptable, or anywhere for that matter. The only reason Breath of the Wild got a bit of a pass for that was the game looked beautiful otherwise, and the slow downs didn't happen constantly. @gatorboi352 I know how "popular" the PS4 is in Japan, apparently you don't. Less than 4,5 million systems in three years isn't really impressive. Nintendo sold more Wii's in Japan in one (!) year. I didn't even like the original but okay, that's cool for people who are fans. @FragRed Amiibo stuff is fun, when does things like, hold data for a Smash cp you train against, save Player gear sets in Splatoon, give out of game continuity costumes like in BOTW or provide character sprites for a game like Mario Maker (where you can work toward getting them in-game anyway). But when Amiibo are a f----g scam is when they lock a HARD MODE behind them like in Samus Returns, have a cool feature like Twilight Wolf Link for BOTW, then not offer any real availability for it until 4 months after the game is announced, or lock content behind Amiibo only released in limited amounts for exclusive retailers (like the recent BOTW Majora ones). That Hard Mode content really has got me worried. I'd rather see Nintendo dual release DLC and Amiibos with the same content at the same time. Give the Amiibos more content than they have now but make it easily available also as eShop DLC, that's cheaper. Also PLEASE release this game in the West. Been on a huge Toriyama kick lately and really need this! I've still got the remake collection that went to the Wii so I'm not bothered either way but this is really cool. If comes to the west and it's on the switch I'll buy. Nice extra. 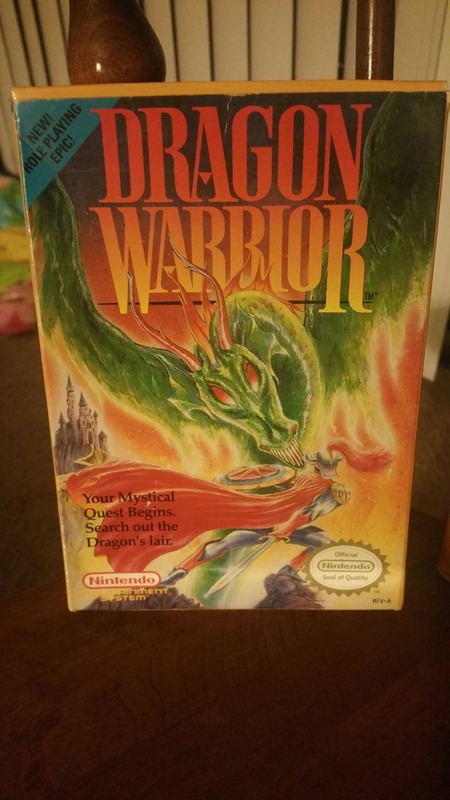 Dragon warrior was my first Rpg when I was a kid. @scamander it's just as popular as the Switch since the Switch has been out. @arrmixer yeah got lucky that somebody offloaded a near mint copy (outer box is a little bent) with all the extras on ebay for 60bucks a few years ago. @Ryu_Niiyama I am guessing all of the text is in Japanese, correct? @ALinkttPresent I wouldn't say that. All the handheld entries you mentioned are ports, with the exception of 9. 8 of the main series games launched on consoles, and we're o ly years later ported to handhelds, so the series is most definitely grounded in consoles. That being said you missed some games. Every main series Dragon Quest has been on a handheld, 1-11. @lemonjellydude If it's the untouched Japanese original, then it has a password save. RAM saving was one of the multiple improvements they made in the localization process. Although I know it's one of the first console RPGs but the original DQ1 battle music has to be one of my least favorite 8-bit RPG battle themes (though there's still a couple I rank lower). Too many high-pitch bleeps compared to other more pleasant bleep tones. I still got the original in its NES form and the Game Boy remake but this is nice for those who never play it. Hopefully Square Enix remake the first 3 DQ for 3DS as well, I know Square Enix had remakes and re-release them various times on multiple platforms (Game Boy, SNES, Wii) but remakes of the first three in the style of Dragon Quest VIII for either 3DS or Switch would be nice. That and #4 were the two of the old series on NES I really dug. The first was so bite sized if you pressured yourself could be finished in an afternoon (which I did on a bet to get my friends cart 20 years ago.) The other I love because it's basically a pile of stand alone MINI-RPGs to enjoy before jumping into the main event.